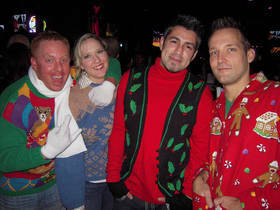 Ugly Sweater Photo Contest and Ticket Giveaway is currently happening over at Metromix TC. All you need to do is send them your best holiday sweater picture for a chance to win tickets to "Miracle on 34th Street" and Keri Noble. Submissions are due by November 16th. If you're not interested in the contest and just want to have some plain ole fun, then join the 2nd Annual Ugly Sweater Restaurant Crawl organized by Wayzata Chamber of Young Professionals.. It's happening in Wayzata, on Thursday, December 2, 4:30-6:30 p.m.
Know of any other ugly sweater events? Let us know!